Covering and Recovering From the Middle. Who/what is "Stellangie"? That's the combination of Stellan and Angie Bengtsson's first names. Who are they? Stellan is the 1971 World Men's Singles Champion and hugely famous coach from Sweden. (I went to one of his camps for two weeks, and can verify it's well deserved.) Angie's a U.S. Hall of Fame player (formerly known as Angelita Rosal) who married Stellan and moved to Sweden for many years. Now both are coaching in San Diego. ITTF Coach John Olsen went to their camp last week, and here's his report, which he wrote for this blog. I want to give people some idea of what a great table tennis camp is like. I recently attended the Stellan/Angie Bengtsson Training Camp at the Willamette Table Tennis Club, Salem Oregon from March 27-31, 2013. If you ever get the chance to attend one of these camps I highly recommend it. There were 14 player slots for the camp. The camp had 2 sessions a day, 3 hours each session with a 2 hour break for lunch. A 3 hour session contained 5-6 drills. Most drills had multiple components, such as initially hitting cross court and then down the line. Each player did the drill, Stellan and Angie would tell you when to switch. At certain times one or two people (depending on whether the camp had an odd or even number) would be taken over to do multiball drills. Angie did multiball in the morning and Stellan did the afternoon sessions. During these multiball sessions you worked on specific things you had asked to improve (in my case return of serve). Find a hitting partner, warm up forehand (FH) for 5 minutes, then backhand (BH) for 5 minutes. Stellan stressed that you should be using the shots you use in a match during warm-ups and drills. It’s OK to hit FH drives for a bit to find your rhythm, but don’t continue to use a drive if you are a looper, go ahead and loop. Players alternated looping and blocking during warm-ups so both partners got practice. At the end of warm-up the players would gather together as Stellan and Angie talk and give us the next drill and explain where it fits into the overall parts of the game. So on any day you would hit with 4 different players. On most drills the level of your partner was not that important. I never had an issue with doing these drills correctly, whether the player was above or below my level. Certain drills, like serve/receive Stellan and Angie would make sure that you were paired with someone close to your own level. Stellan or Angie would circulate during the drills correcting technique, answering questions and make suggestions. Angie would also record you with an iPad and be able to instantly show you what she was talking about regarding your technique. Every drill related to some aspect of match play. Stellan would explain not only how to do the drill, but what specific skill that drill was designed to help you improve. He would also tell us what bad habits to watch out for so that we were doing the drills correctly and getting the most benefit from them. I have to say that I have never experienced this kind of detailed information about training drills before. At times Stellan would substitute competition for a drill. We played Brazilian Teams twice and King of the Table once during the camp. Also note that you do 4 stretches a day. Normally when I play I do a few minutes of warm-up stretching. What we did at the camp was much more extensive. The point of the cool-down stretches is to not just prevent injury but to relax your muscles and reduce soreness. I am 56 years old and not in the best of shape, but I had fewer sore muscles the entire camp than I normally have from a single casual 3 hour playing session. I coached a junior player on Sunday morning before he played in the MDTTC tournament. He seemed a bit nervous, so this is what I told him. "If you lose, there will be earthquakes and tornadoes, the polar ice caps will melt and kill off the polar bears, there will be pestilence and hunger, the earth will spin out of orbit and into the sun, and the sun will go supernova, spewing radiation throughout the galaxy and killing off all intelligent life. So the galaxy is depending on you." I often say things like this to help relax players. Before big matches we often talk about TV shows or sports teams, anything but tactics until maybe five or ten minutes before the match. (We do, of course, discuss tactics well in advance; what we do just before the match is a review.) People often see me in animated discussion with players before a match and assume we're talking high-level tactics when we're really discussing the Baltimore Ravens or Orioles, the TV show NCIS, the latest movies, or who knows what else. Who is the Greatest Celebrity Table Tennis Player? Here's a video (8:24) of the all-Chinese Men's Final, where Xu Xin defeats Ma Long. Here's an article on it from Table Tennista. Here are the Men's Semifinals, Xu Xin vs. Yan An (4:03), and Ma Long vs. Wang Hao (7:15). Here's the Women's Final (13:22), Seo Hyowon vs. Kasumi Ishikawa - and see the serve Seo pulled out at the end to win! (Time between points has been removed in the videos, so non-stop action.) Here's a video (5:40) of the Korean Open's Top Ten Shots. There are more international articles at Table Tennista, covering the Korean Open, the German Bundesliga (Timo Boll injured! ), and others. I just realized that the Tip of the Week I published this past Monday was the 1400th article I've had published. (Cue the confetti.) There's a bit of ambiguity in there, as what constitutes a published article? I don't count blog entries (over 500 here since I started two years ago), but I do count the Tips of the Week. (For one thing, they are also published at Paddle Palace.) Included among these 1400 in 138 different publications are 1258 on table tennis. Here's a complete listing. I maintain a number of webpages. This seems like a good time to post them. (For one thing, I'm battling a cold, and this will be an easy blog to write so I can get back to bed.) Here are the main pages. Each of them includes many sub-pages. TableTennisCoaching.com. If you are reading this, you are there. Here's your chance to explore some of the pages here. For example, have you gone over to the "Fun and Games" section? Lots of hilarious table tennis stuff - videos, pictures, and games. CelebritiesPlayingTableTennis.com. This is where you can find 1440 pictures of 870 celebrities playing table tennis. This is the most important page on the Internet. (I used to update this monthly, but it's rather time-consuming so these days I do it sporadically. TimBogganTableTennis.com. This is where you can buy copies of Tim Boggan's history books, History of U.S. Table Tennis, Volumes 1-12. You can also learn about the famous Tim himself! (I do the page layouts for Tim's books.) He's almost done with Volume 13! (Each time he finishes a volume, he drives down from New York to Maryland to stay with me for two weeks, where he'll sit next to me as we do the page layouts together. I do the actual layouts while he waves a finger at the screen saying things like, "No, you fool, the photo goes there!!! And I don't like that font - invent a new one!" Larrytt.com. This started out as my table tennis coaching page, where I listed my credentials and recent adventures. It's since become basically my everything table tennis page, where I just keep adding stuff. Larryhodges.org. This is my science fiction and fantasy writing page. As readers of this blog know, outside table tennis I write SF&F - I've sold 65 short stories (also 30 resales and 15 paid "twitter" stories), and have two novels making the rounds. I also maintain a page on writing science fiction & fantasy. 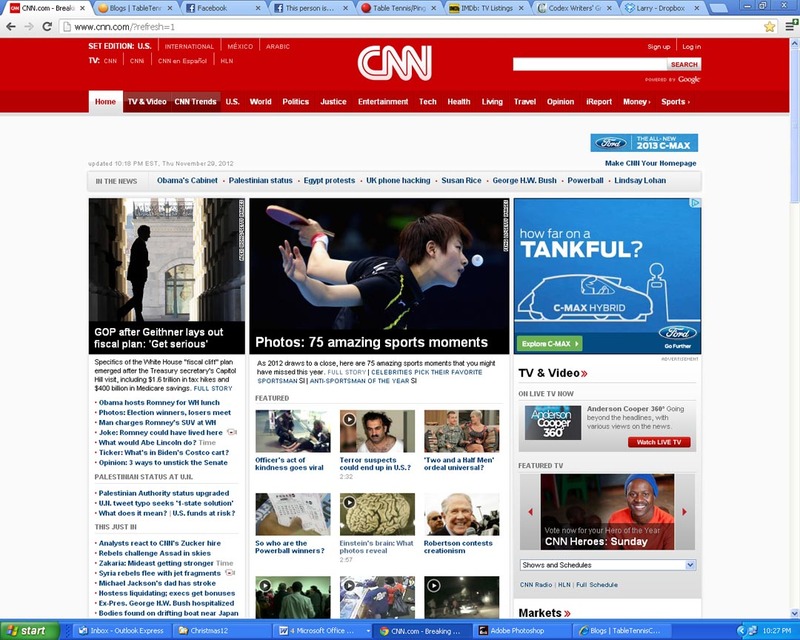 Here's a screen shot of CNN.com last night, with the picture of Ding Ning of China featured. The caption is, "Ning Ding of China plays a forehand during the women's singles table tennis quarter-final match against Ai Fukuhara of Japan on Day 4 of the London 2012 Olympic Games on July 31." (I think the Ding is supposed to come before the Ning.) It was part of a gallery of "75 Amazing Sports Moments" from 2012." See photo #20. Here's an article from the ITTF on Stellan Bengtsson, former World Men's Singles Champion and now a coach in San Diego. Here's an article from TableTennista, "Zhang Jike Not Satisfied With His Condition." Since I'm fighting a cold, this seems a good time to link to these guitar strumming songs by Dan Cole. Dealing with Cheaters and Poor Sportsmanship. Since this week's Tip of the Week is on Cheaters and Poor Sportsmanship, let's continue the trend and look at the dark side of coaching. There are lots of great coaches out there. And I've often blogged about good coaching habits. However, let's talk about the other side of the coin: bad coaches. Here is a list of seven types of bad coaches. (I'm sure I missed some.) There is a lot of overlap between these categories, and the differences between some of them are subtle. There are probably bad coaches who combine the worst of multiple categories! Self-taught coaches who either don't really understand high-level table tennis that well. Often they were mid-level players who really think they know the game, but don't have the experience to realize they don't. The stereotypical example is the player who has had little or no experience in watching top players develop, but believe they know how it is done by watching the end product, i.e. top players (usually on video) after they have already become top players. Highly perceptive people can sometimes learn to be good tacticians this way, but to learn what a top coach does in the practice hall you have to be in the practice hall to learn. Highly-opinionated coaches who can only teach one way, and often are mistaken in what they do teach. They usually were not top players, and teach techniques that they themselves have little experience at and which they don't really understand. These types of coaches are legendary, but players usually see through them once they start observing what top players actually do, and see that there are sometimes multiple ways of doing something, depending on the player's style and technique. Those who can only coach their own playing style. Often they are former top players. I've seen coaches take well-developed and successful styles and practically destroy them by trying to make them play the way they did. A good coach understands the game in general, not just from his own game's point of view. Some top players are masters of knowledge regarding their own game and how it relates to playing other styles, but only know little beyond their own game. Those who live in the past, who essentially say, "This is how I did it, this is how my coach did it, and this is how my coach's coach did it, so that's how you will do it." I call these types of coaches "Parrot Coaches." These types of coaches are unable to change with the times as new techniques are developed. Those who do not personalize, and instead teach everyone the same. This comes out of pure laziness. Those only out for money, and are impatient or unenthusiastic. They often teach sound fundamentals, but getting them to take the extra effort to really develop someone as a player is like pulling teeth. Table tennis sports psychologist Dora Kurimay interviews Coach Stellan Bengtsson (1971 World Men's Singles Champion) on the most important aspects of sports psychology. Here's an article from the Tampa Bay Times on the Spin City Sports full-time table tennis club in Largo, Florida. Since we have an interview with Bengtsson on sports psychology, it's only appropriate that we end with a video of a Ping-Pong Death Match (5:28). Ever play ping-pong with a guy who takes the game way too seriously?